The critters of Oakton City have been living large. 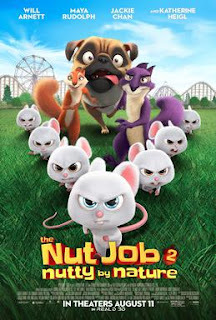 Under the leadership of Surly, a grumpy purple squirrel, the interspecies community of moles, groundhogs, squirrels and a pug dog have loved their life in an abandoned, but fully stocked, nut factory. Red squirrel Andie believes that the animals are getting soft in the nut factory, and she encourages younger critters to learn how to forage in the local park. 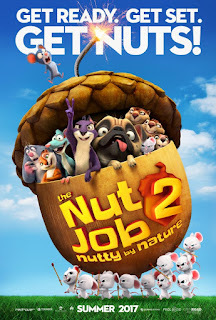 The question of feast or forage soon becomes replaced by a shared struggle for survival; the nut factory explodes, and the park (which had been a surefire backup plan) is scheduled for demolition to make way for a theme park. 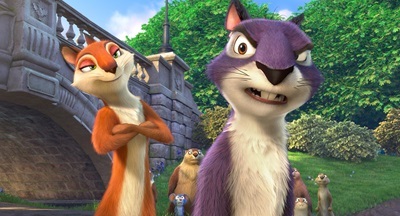 Now, the animals must join together to save the park. There is no mention of adoption in the movie. A cruel girl does take a dog into her home against the dog's wishes, but the dog escapes. 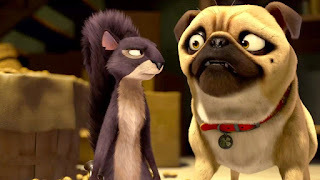 The animals do lose a home, and are threatened to be run out of another. They worry about not having access to food, and one animal repeatedly asserts, “We’re all gonna die,” sometimes in response to the scarcity of food. It’s not an adoption connection, but kids who have experienced neglect or kids who remember being removed from their home of origin might find these themes to be difficult. 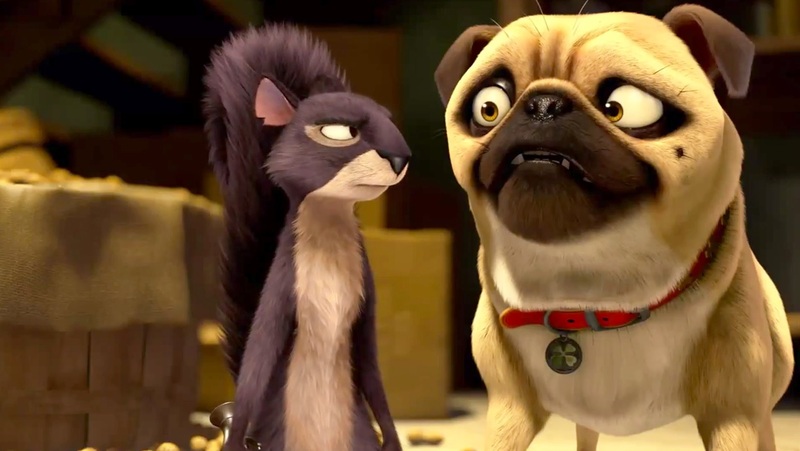 The squirrels, pug, and other animals show a strong sense of loyalty to each other. Surly has a lifelong friend named Buddy; each has saved the other. They came together during a major storm that threatened their lives, and have stuck together since then. A child is cruel towards animals, and her father threatens to mount their heads on his wall. Surly has a lifelong, loyal, mute friend named Buddy. For a couple minutes, it seems as though Buddy falls to his death due to Surly’s brief moment of showboating. Buddy is laid out on a slab with all the somberness of a funeral, but he does recover. A community of mice reflect on a time when they were cast out of their home, and “nobody was there to save us.” They have grown strong, but bitter. However, when they learn of Surly’s plight, they decide to prevent the same displacement from happening to Surly’s friends. A character comments that, although individually they’re very tiny, “together we’re giants.” They are able to work together to save the park. 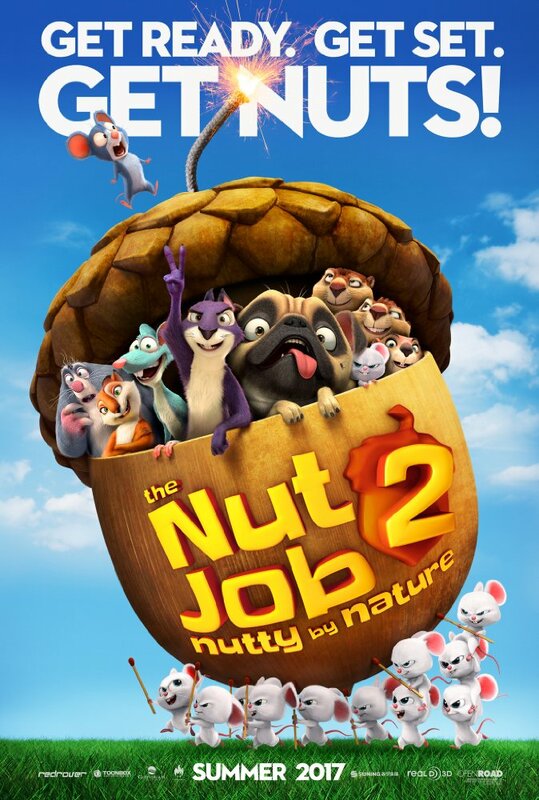 The Nut Job 2 has moments of silliness, moments of grossness, and some themes that could be difficult for kids who’ve experienced insecurity of home or food. It also depicts the loyalty of friends, the resiliency of people who have been vulnerable, and the power that even small people have if they work together. Except for kids who would be bothered by some of the themes I’ve mentioned, this one seems generally good for an audience around the ages of 6-10. After watching it, considering talking to your kids about the things that make them feel safe, their close friends, and the power that they have to accomplish great things while working in conjunction with friends. Who are some of your closest friends? What things about home make you feel the safest? What things about home do you like the best? forage for nuts in the park? When have you seen tiny people (or kids) work together to do something big?